He’s at ease dodging competition for the basic reason that, whoever he handpicks as an opponent, there are those who pay to watch his fights enough to make him richer every time, by several millions of U.S. dollars. Thus, Floyd Mayweather Jr. may retire without fighting Manny Pacquiao or any prime boxer in Floyd’s level who has a potential to beat him. Thus, he doesn’t feel obliged to compete in boxing considering boxing is a sport, not a vaudeville show. Thus, King Floyd continues to sit atop his throne to rule the sport and everyone involved in it. Kudos, who shares the blame? The Harlem stars are excellent ball handlers who are amazingly entertaining inside a basketball court. They are cuts above the NBA and Olympic players but only as long as they play basketball for exhibition and not for competition. Mayweather’s words will not suffice to convince the people. He is not the Author of the Good Book. Neither is he the Ultimate Judge. Floyd has to prove himself way beyond his self-assertion as being the best. Only the existence of a Supreme Being doesn’t require proof because proof is all around us and in every tick of the Clock within every bit of the human heart. We so esteem winning that we overlook what priceless gems there could be in “losing”; and what infinite vanity and traps there may be in “winning” without humility and true worship. Mayweather has become so obsessed protecting his “0” that he must be missing the finest of experiences that life can offer down the road of grace and unspeakable joys. Contrary to virtue, the world venerates success. We highly esteem achievers or the “best” until the “better” one comes along. The undisputed Fighter of the Year for 2012 is a living example. Nonito Donaire was praised and adulated by experts and fans. Prior to his fall, the “Filipino Flash” was being considered the future pound-for-pound number one until the Cuban tactician beat him in New York on April 13, 2013. Unanimously the darling of the press before he was “schooled” by Guillermo Rigondeaux, Donaire was abruptly dumped and nailed in obscurity by the same cults and devotees who used to chant “hosannas” on his way to glory. Such is what dreads Mayweather. And such is the scenario he’s been trying to avoid by avoiding competition. 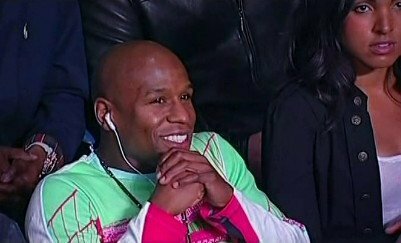 Mayweather studies his potential foes before he decides. And he knew Marcos Maidana too well to pick him to add another “W” in his record. He surely is not scared of Maidana. Otherwise there would be no MGM show on May 3 dubbed as “The Moment” (for what?). Shadows are created only when light and darkness co-exist. Most objects of fear are unreal. A person who is frightened of anything or anyone is usually and merely frightened of his shadows. The problem with Mayweather is that the fans believe in him more than he believes in himself. Floyd has his own most cherished fear as his worst enemy. He may not be afraid of Pacman, after all, because he’s just afraid of himself. Tragically, unknown to Floyd, it aptly corresponds to him being scared of becoming great, and truly the best. Why patronizing the “Maywether-Maidana” is a backward move for boxing? Why Floyd will be “Floyd” until we do what’s right? Whose fault is it why Mayweather continues playing balls in the ring instead of fighting? And for what cause is Mayweather ducking Pacquiao up to now when Pacquiao lacks the tools to beat him if their last fights versus Canelo Alvarez and Timothy Bradley would be the basis?